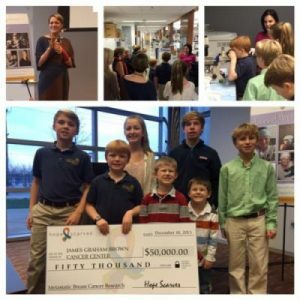 Hope Scarves donates $50,000 to research! Hope comes in many forms. At Hope Scarves we share hope as scarves & stories. Over 3,000 sent around the world… And, now we have expanded to RESEARCH! Thanks to the overwhelming support of donors (like you!) we made our first donation to the University of Louisville Clinical and Translational Science Institute on Tuesday, December 10th. 100% of our gift goes directly to Dr. Yoannis Fernandez-Imbert and the work she is doing to understand the role of glucose metabolism and Metastatic Breast Cancer. She and her team are working to determine the effects of simultaneous suppression of estrogen signaling and a key metabolic enzyme known as PFKFB3 on sugar metabolism, growth and survival of metastatic breast cancer. This research has real world potential to change patient care in the near future. 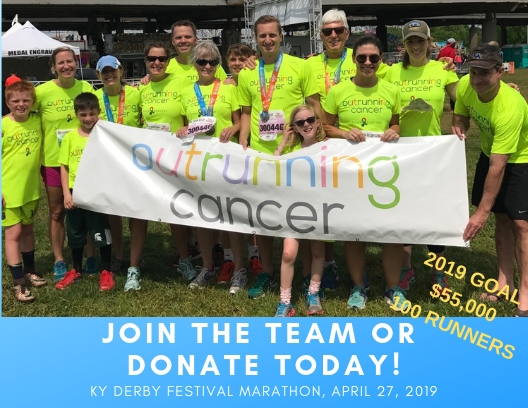 I am pationately dedicated to ensuring our donations support tranlational studies that can go from the research bench to bedside, creating better treatment options for people like me living with this disease. This gift to UofL is just the beginning. I am working with other organizations who share my vision to increase support for translational metastic breast cancer research and plan to collaboratively make an even bigger impact in the future. Stay tuned! A portion of each dollar Hope Scarves raises goes to translational research. Or, you can give directly to the Metastatic Breast Cancer Research Fund. (Shameless plug! No pressure… just sayin…) Thank you to our friends who supported Hope Scarves to make this possible. We promise to be good stewards of your gifts and look forward to what we can do together in the future. I wish you and your families a wonderful, hopeful holiday. It will be for us, that’s for sure. Your holiday safety message–> Use the proper tool for the job. Last week I attempted to deck the halls by cutting a magnolia with a kitchen knife… and subsequently sliced my thumb. 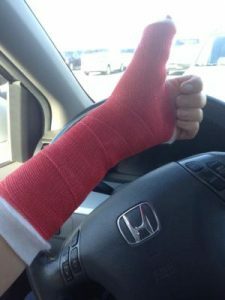 Through the tendon… que ER trip, emergency hand surgery and very tight, annoying cast for 3 weeks followed by intense physical therapy… Yes. For real! All this lead me to be very frustrated, sad and mad at the world. You see I have been relaying on the kind help of others for the past two years. This holiday I was “back!” I was planning parties, decorating, baking. Coming off a great birthday and so excited for the holidays. I had gotten to a point in this crazy ride where I was allowing myself to be happy… carefree even, It felt great! And then, with a split second and newly sharpened knife… I was broken again. After tears and being a real B&*ch I am reminding myself… this will heal. This could happen to anyone… it’s totally life! Life!!!! In all it’s frustration, pain, itchy castness. This is what I’m fighting for. Of course, I’d rather it be joyful and happy. But even in the frustration and brokeness… I am living. So, when things don’t go your way. When you or someone you love slips up. pause. (allow yourself to scream & cry if you need to) Take a look at the bigger picture and rally for this one, messy, imperfect life. Hug. laugh… live! This past weekend we all focused on gratitude. A feeling hard for many facing advanced disease or crippled by fear. A feeling I searched for in the midst of panic just two years ago. Now, as I approach the holidays in a healthy, strong body I am overwhelmed with gratitude. I wouldn’t have dreamed I would have so much time to truly “be me” after my metastatic breast cancer diagnosis. But, here I am- healthy and living life to the fullest. It is hard to share this happiness when I know so many with this disease who are not doing well. I watch family after family crumble as they face a future without a mother, sister or friend. For a long time I was afraid to celebrate my health for fear of making the fall back into sickness harder. Holding this joy back in compassionate consideration of friends whose bodies are not healthy and for whom these experiences aren’t possible. You see, I am in a slim percentage of patients with this disease whose body is holding strong against the cancer… for now. And so, for now, we celebrate and give thanks! Because I don’t ever want to look back on these healthy times with regret. I want to live each day in the fullest, most positive, meaningful, biggest way I can. So…this past weekend – in typical Team Mac fashion. We gave thanks for friendship, family and birthdays! Starting with a 40th birthday party for a dear friend in Louisville, An exciting day of football on Sat with our Alabama framily (Roll Tide!). Followed by a surprise trip to New York City, planned entirely by my amazing husband, Jay, to celebrate by 39th birthday! Team Mac took on the Big Apple – Museum of Modern Art, Nike Town, Times Square, Today Show, Ice skating in Rockefeller Center, Walking the high line, Chelsea Market, 5th Avenue, carriage ride in Central Park, great meals, subway rides, Lion King on Broadway, football in Central Park, Top of Rockefeller Tower and so much more! Walking hand in hand with each of my boys, sitting on the floor of the MOMA with Bennett on my lap staring at water lillies, watching the sunset behind the skyline as we played football, walking and walking and walking and the boys being so excited. So many precious shiny golden moments of joy to add to our memories together! Then, flying to Michigan to spend the Thanksgiving holiday with family at Jay’s parents cabin! The snow fell as we snuggled together by candlelight telling stories, playing cards and listening to cousin laughter. Sledding, champagne, hiking, horseback riding, euchre, delicious meals, art projects, saunas, cozy warm mornings sipping tea by the fire and talking. More shiny gold memories…. I’m glad to say we’ve always lived our life this way – big adventurous fun. But, now that time is even more precious, we do it even more. Four states in a week. I love this happy, healthy time together as a family. I want it to last forever. At least I know the shiny golden memories are tucked away in our hearts. forever. Don’t wait to make these memories with those you love. And when you find yourself in the middle of one of those shiny gold moments – pause and give thanks. Tuck it away and hold it tight in your heart. 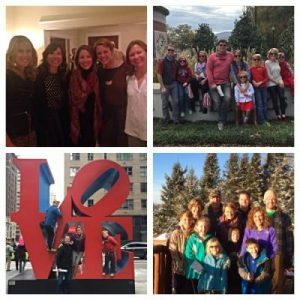 In the spirit of holiday giving this month we are spotlighting one of our recurring volunteer organizations.